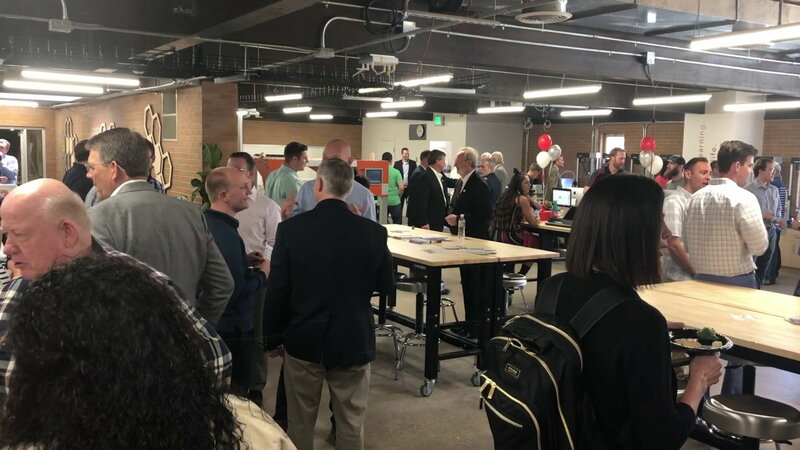 ST. GEORGE — The completion of the first phase of Dixie State University’s Atwood Innovation Plaza was celebrated with a ribbon-cutting Monday, marking the opening of the largest public “makerspace” in Southern Utah. 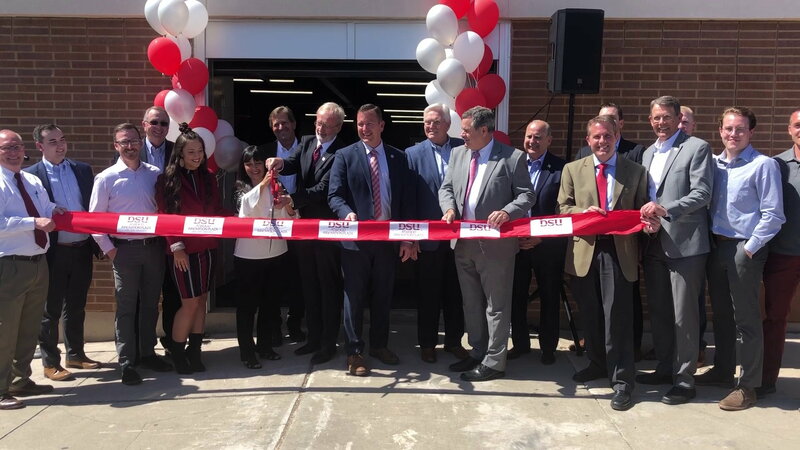 “This creates a culture, and that culture is really about entrepreneurship, innovation and opportunity,” Kyle Wells, dean of Dixie State’s College of Business and Communication, said prior to the ribbon-cutting. The Atwood Innovation Plaza is to be a place where university students and community members can take business and product ideas from concept to reality. 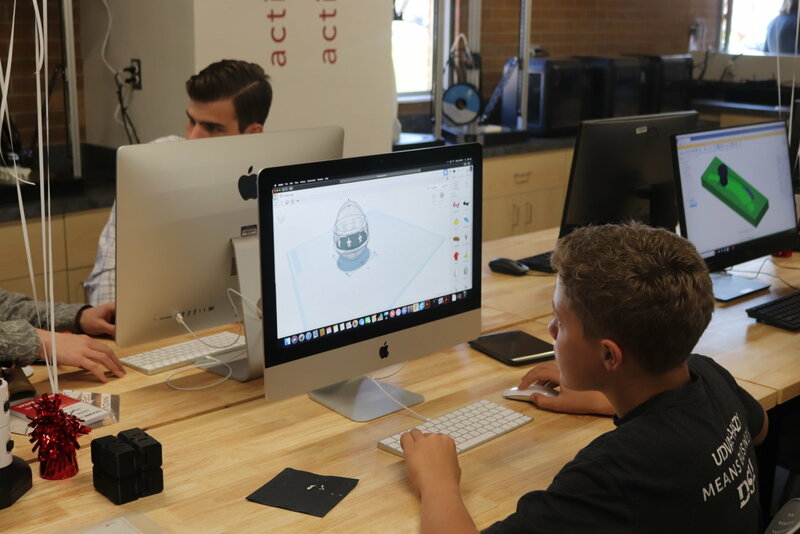 In the newly opened makerspace, individuals have access to computers, 3D printers and other equipment geared for the creation of product prototypes and small-run manufacturing. “Today we celebrate the fact the community can now use all of this equipment that they typically wouldn’t be able to use themselves or for home use,” said Don Willie, executive director of DSU’s Technology, Innovation and Entrepreneurship Center. Once a prototype is made, the Atwood Innovation Plaza offers ways the product’s creator can patent the product, create a business around it and market it, said Willie, who oversees the plaza. Aiding entrepreneurs on the business side are no-cost consultants and area business owners who are a part of the Business Resource Center, which is also housed in the plaza. Programs related to the plaza have already produced over 80 patents and supported and launched a number of small businesses, Willie said. Among those who helped get the plaza rolling was Wayne Provost, Dixie State’s director of Innovation Guidance and Solutions. Provost has helped guide university students, faculty and community members through the patent process. He holds several patents himself for mechanical, dental and medical devices, and software. A patent for a device that generates electricity through a combination of wind and solar power was donated by Provost to the university. He said a device based on the patent is being testing by a company he declined to identify. The death of his 17-year-old son a decade ago put Provost and his wife on a course of helping others that eventually led them to Dixie State. Provost said his hope for the makerspace is that it becomes a place for students and the community where kids can come and not be put down for their ideas but uplifted and driven to success in their pursuits. Lindsay and Laura Atwood helped fund the first phase of the innovation plaza that bears their name. Last year they gave $1 million to the facility as a part of a matching donation to a grant from the U.S. Department of Commerce. “The whole basis of this is for our children,” Lindsay Atwood said at the ribbon-cutting. 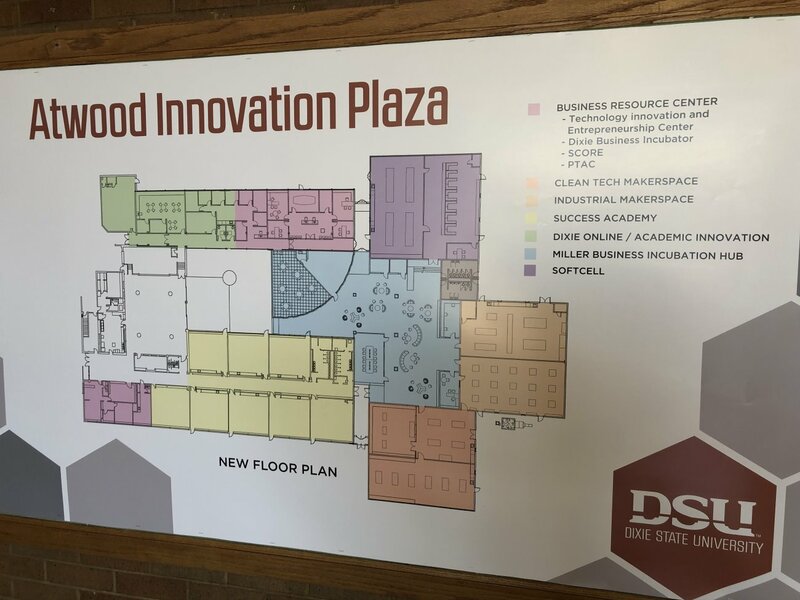 The innovation plaza is a piece of the overall vision that Dixie State University has for the future, which is to help create a highly skilled regional workforce, as well as help entrepreneurs get their ideas off the ground, Atwood said, adding that it’s a vision he’s bought heavily into. “We’re very honored to be able to do this,” he said. The Atwood Innovation Plaza is located on University Avenue/700 East across the street from Trailblazer Stadium. The building that houses the plaza was originally East Elementary School and was bought by the university four years ago. The grand opening for the remainder of the Atwood Innovation Plaza is expected in November when the second phase of the renovations to the old elementary school should be complete. Additions coming with the second renovation include a wood shop and metal shop, as well as a biotech resource lab run by Soft Cell Biological Research.